Mission Crossroads 17 others?" Her answer is leaving a legacy of good across her church and around the world. 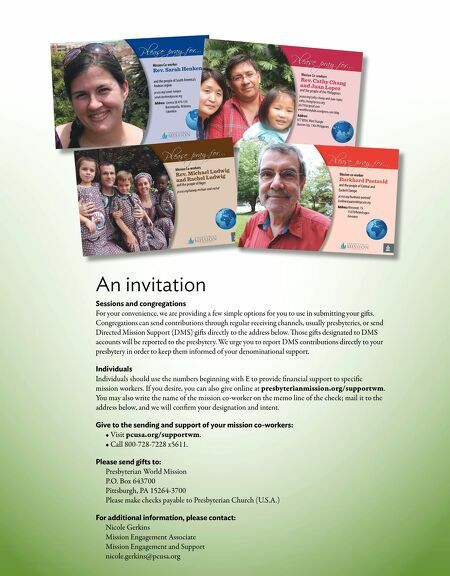 M elva Costen exudes a faith that crosses borders through the sharing of songs and the shaping of pastors. As a professor of music and worship at the Interdenominational eological Center (ITC) in Atlanta, she shared the music of the world with future pastors and others. Melva, now retired, brought this passion to her work as a member of the committee that produced the first hymnal of the newly reunited Presbyterian Church (U.S.A.). Melva's love for the global music of the church was especially nurtured by Kenyans who studied at ITC. Melva and her late husband, James, who became president of ITC in 1983, began building relationships with Kenyan Presbyterians in the 1970s. At the time, James was dean of Johnson C. Smith Seminary, a Presbyterian seminary that was then part of the consortium of graduate theological schools that comprise ITC. "When Jim and I made our first trip to Africa, we fell in love with the whole of Africa, especially Kenya," Melva says. e Presbyterian Church of East Africa (PCEA) was growing rapidly, and its lone seminary in Kenya was struggling to train enough pastors to serve its congregations. James and the PCEA arranged for dozens of students to come to Atlanta for study in a partnership endorsed by U.S. Presbyterian mission leaders, Melva notes. rough Kenyans and other African students, Melva began to see more clearly the African roots of traditional African- American songs. "It was amazing how black Americans were hungry to find this," Melva recalls. "It broadened our perspectives as black Americans, and it helped us understand God in a different light." e music from Africa and other places around the world, she says, has enriched the entire PC(USA). After James retired in 1997, the Costens joined with PCEA leaders to help develop the church's second theological school. Although it has evolved into the Presbyterian University of East Africa, theological education remains a key component of its mission, says Jon Chapman, who was the PC(USA)'s coordinator for East and Southern Africa when the school was founded. e Costens' tireless fundraising helped put the seminary on a firm footing, says Chapman, who is now retired and living in Dover, Delaware. "ere is no way the school would be where it is today without Jim and Melva." James, who died in 2003, was moderator of the United Presbyterian Church in the United States of America in 1982 when it reunited with the Presbyterian Church in the United States to form the PC(USA). Earlier, while James was a pastor in North Carolina, he and Melva worked to integrate schools and other public facilities. In Atlanta, the Costens helped form an interracial congregation. James was instrumental in moving Johnson C. Smith from Charlotte to Atlanta to join the ITC consortium, which had been formed by schools from historically African- American denominations. For Melva, her motivation for service is summed up with a single question: "What can I do with what God has given me to facilitate the ongoing life of Melva Costen Enriching the life of the church through global music and theological education Pat Cole STRENGTHEN MISSION PARTNERSHIPS Support the work of Nancy Collins, regional liaison East Central Africa. pcusa.org/donate/E200471 As a musician and professor, Melva Costen shared a global perspective that continues to strengthen churches in the U.S. and beyond. 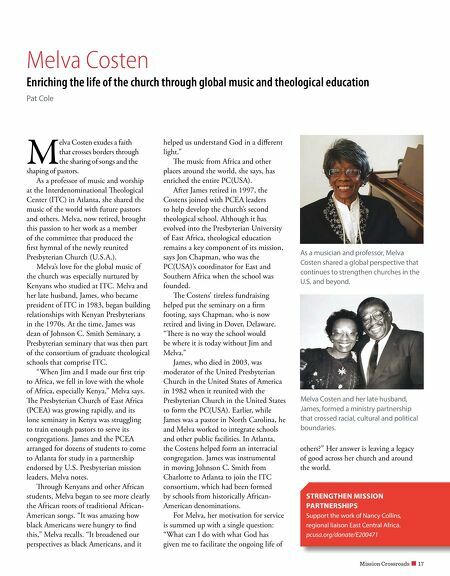 Melva Costen and her late husband, James, formed a ministry partnership that crossed racial, cultural and political boundaries.